Joanna Macy’s blurb on the dust jacket of The Great Turning says, “Here is the book we’ve been waiting for.” I agree, this t our de force will clarify and strengthen our efforts. That said, it’s one big dagwood sandwich of a book. Digesting it all takes perseverence, because Korten aims to provide both comprehensive understanding of the task at hand as well as several layers of strategy. Korten’s article in the Summer 2006 of Yes! magazine (online at YesMagazine.org) covers the basic points, but the book provides more dynamism and much more to chew on. Folks have been asking me, does he credit Joanna for the term Great Turning, and does he mean the same thing by it? Yes to the first: he tells the story of the gathering of social change leaders where Joanna offered the term. Yes also to the second: it’s the same Great Turning. However, Joanna’s three components of the Turning (holding actions, building Gaian structures, and shifting consciousness) refer to ways people are participating. 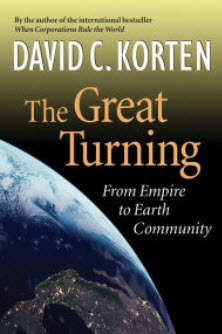 In the Yes article, Korten’s “Three Turnings” (cultural, economic and political) refer to the spheres of human society which need to be turned. Korten’s pivotal theme has two parts. First, we must understand that what we’re up against is Empire. His engrossing analysis of Empire as the primary driving force in Western civilization begins 5,000 years ago, with special emphasis on the formative years of the United States and on the past few decades. Second, our fundamental task is to wrest from Empire its control of the stories by which people in the U.S. define ourselves: the stories of how we attain prosperity, how we attain security, and what gives meaning and purpose to our lives. He weaves in a heady and (to me) sometimes overwhelming array of supporting themes: life sciences and creation’s epic journey; human developmental stages; layers of strategy including exploiting the vulnerabilities in the Far Right’s agenda, forming communities of congruence (Interhelp would be one), and building a majoritarian political base, to name a few. I finally sorted all the ideas by creating a mind map of post-its. I’m glad I took the time, because now I feel energized and more articulate about this Great Work and my part. Another approach: use the study/discussion guides (DavidKorten.org) for personal reflection or, better yet, group study. At the end of the book, Korten raises the question, how do we sustain our activist energies and not succumb to burnout or despair? In answer he offers a response by the tireless Indian activist, Vandana Shiva: we must maintain deep passion and also deep detachment. Korten doesn’t say much about how we manage to do that. My immediate thought: the Work that Reconnects, of course! The depth of emotional and spiritual work, along with connection and community, that our work provides is an answer to this call. It serves those of us already committed to working for the Great Turning, and also those who are feeling mired in the old story and “come up for air,” perhaps in a workshop, perhaps in a conversation. Let’s keep doin’ what we’re doin’; it couldn’t be more important. Paula Hendrick has been a student of The Work that Reconnects since 1981, when she participated in a ‘”despair and empowerment” workshop with Joe Havens and Sarah Pirtle at the Traprock Peace Center in Massachusetts. She has cofacilitated several workshops in the Seattle area when she lives, and happily connected with Interhelpers at the Rowe Conference Center last fall. Paula also creates Universe Story necklaces, with beads chosen to tell the Deep Time story of our human and more-than-human journey.